This video shows Electrix, LTD in New Zealand erecting the VER-T-POL in approximately 12 minutes. Click on the icon to the right to open a PDF file containing the installation instructions for the VER-T-POL. Portable supports are sectional, to be pinned together during installation. Stiff legs constructed of steel with adjustable turnbuckles. Largest piece weighs approximately 70 lbs. Total unit weight is 320 lbs. Designed to be maintenance free. Each unit is identified by a serial number. Transfers complete weight of a structure to VER-T-POL portable structure support, holding it vertical. 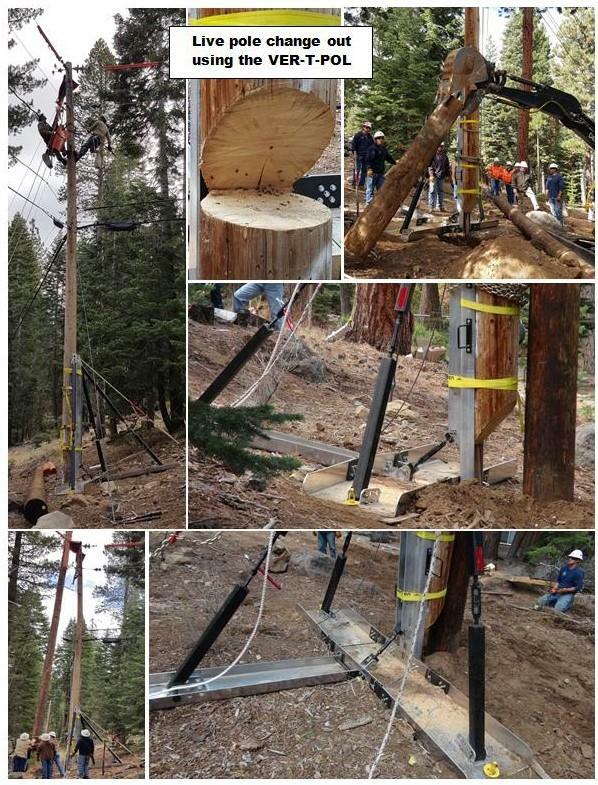 Eliminates relocating utility poles when excavating and utility poles face the possibility of being undermined. In high traffic areas, the VER-T-POL takes the hazard away from having to park a line or boom truck at the work site to hold a utility pole vertical during excavation. Keep overtime down when dealing with broken or rotted poles during off hours and inclement weather. A major factor is the ability to install/remove the VER-T-POL in blind easement situations. Once at the work site, the VER-T-POL can be installed in approximately 15 minutes. Removal time is approximately 10 minutes. Normally a structure would have to be relocated, then after excavation was completed, the structure replaced to its original location. To support broken and damaged transmission and distribution poles. To support poles being excavated around. To support dead end pole where anchor and down guy need to be temporarily removed. To change out a rotten/bad pole in restricted areas where a truck cannot access. To erect poles (in areas where a truck or large equipment can not gain access). For storm recovery (to restore electrical and phone service to customers quickly after a storm). To erect and stabilize steel beam supports for new construction on steel buildings. To support scaffolding for large construction. To support existing pillars on bridges for repair or replacement. To support aircraft or aircraft landing equipment for repairs. In rescue situations where rescue vehicles and equipment cannot gain access (Police/Fire). To train cables for underground systems (electrical, telephone and fiber optic systems). To support traffic signal poles until pole replacement or repairs can be made. In landscaping to support a tree until it is established. Used with attachments to raise/lower equipment in manholes or wells weighing up to 21 tons. In the history of the VER-T-POL's usage (18 years), it has never failed and not one person has ever been injured while using the VER-T-POL. For the safety of your employees, and in accordance with OSHA rules: Section 1926.651(a) Surface Encumbrances, states "All surface encumbrances that are located so as to create a hazard to employees shall be removed or supported, as necessary, to safeguard employees." The use of the VER-T-POL is a must! VER-T-POL is certified by two (2) Professional Engineers to support 21 tons (42,000 pounds working load). 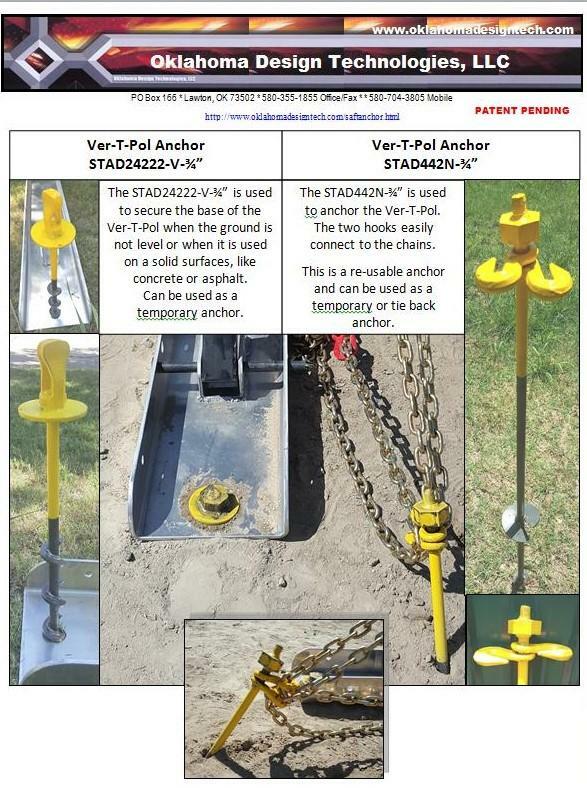 It is our professional opinion that by installing the VER-T-POL on your job site, you are acting in the best interest of safety for your employees, as well as increasing your production and saving your company money. The VER-T-POL is the only portable mechanical device in the world that is "Professionally Certified" to support an object weighting up to 21 tons in a vertical position. position for an extended period of time.